Are My Holiday Traditions Yours Too? Ah, holiday traditions. ‘Tis the season for them, no matter where you’re from or what you believe. Chanukkah is over, unless you’re like my family and waiting for everyone to come home around New Years to celebrate together, and most people are putting the chanukiot and dreidels away and bemoaning the piles of latkes leftover in the fridge. Still, Jews have another holiday with its own traditions coming up. No, you didn’t forget one; it’s merely Sleeping In, Chinese Food, and Movies Day, or what most of the world considers Christmas. This year, I’ll be adding something to my Christmas Day plans: participating in the DCJCC’s annual December 25th Day of Service, which brings together over 1,000 volunteers to bring some warmth and cheer to over 10,000 DC, Maryland, and Virginia residents. EntryPointDC and a grand group of good-hearted young professionals will be at Change Inc., a social services organization in Columbia Heights, throwing a party for children of local, low-income families. Not only will we bring gifts, but we’ll have snacks, art and crafts projects, and maybe, if they’ve been good, a visit from Santa. It’s a couple hours out of a day when we’re not at work anyway, and what mitzvah to bring some holiday cheer to kids who may not get it anywhere else! (And no one said anything about not getting Chinese food and seeing Les Miserables after…). You can sign up here to join us, spaces are still available! Any other interesting December 25th traditions out there? Filed under: EntryPointDC | Tagged: Community Service, EntryPointDC, holiday traditions |	Comments Off on Are My Holiday Traditions Yours Too? Young professionals and college students are taking a deep interest in connecting to our remaining Holocaust survivors. For example, in New York City, hundreds of volunteers team up with the iVolunteer organization to visit often-lonely Holocaust survivors and become like family. While health and financial needs plague today’s survivor population, the worst poverty is loneliness. These feelings are greatly alleviated through volunteer visits. But honestly, I feel like the volunteers get more out of these visits than they could ever give. However, while Jews across the world remember the Shoah this week, there is a large number of people who are unaware of the critical need for basic safety net services for many of the frail and aging Holocaust survivors who live right here in our own community. In light of all these issues, EntryPointDC partnered with JSSA to create an Inter-generational Passover Program with Silver Spring-area Holocaust survivors on Good Deeds Day. This was a memorable event not only for the Holocaust survivors, who were elated to have the opportunity to tell their personal stories and socialize with each other, but also for the young professionals who got to connect with them. For one participant, it was his first time meeting a survivor, never having had the opportunity first hand. For a young woman, who is an Iraqi Jew , it was important to her to come because her own family had been persecuted in Iraq. Another came to connect with his Jewish heritage for the first time since the passing of his father. These connections are so important to our community. This June, we’re trying to make more of these inter-generational exchanges happen. We want to connect survivors and young professionals with our Service For Survivors Trip – a Service Learning Trip to Miami Beach, Florida. Participants from EntryPointDC, GLOE, Community Services, and other partners will be joining us. Truly, we welcome anyone in their 20s & 30s to join us in this mitzvah. As the last generational link, we are almost out of time to hear their stories. And then, when the time comes, we’ll pass those stories on. Yom Hashoah, Holocaust Remembrance Day, is a time for commemoration and reflection about the Holocaust and the six million men, women, and children who lost their lives because they were Jewish. Yom Hashoah, which falls on Thursday April 19th, is also a day to honor the survivors and listen to their stories. I love working at a place where we get to look at these stories in multiple ways, knowing that everyone connects to it in different ways – whether it’s through film (Nicky’s Family) or art (Traces of Memory: A Contemporary Look at the Jewish Past in Poland), or through conversations. The important part is that the connection happens. My own interest in Holocaust studies began in my eighth grade Holocaust course with my teacher Mrs. Silverman. Unlike other projects in the past, the research projects in her class did not feel like homework, but rather like an opportunity for meaningful exploration – not something that junior high students often get to experience. That eighth-grade project on survivors impacted the rest of my life: I’ve been studying and teaching the Yom Shoah ever since in some way or another – the power of having an amazing teacher! My goal is to help others have similarly resonant experiences with this survivor community. In Jacksonville, Florida, I brought my public school students to a Yom Hashoah program at the Jewish Community Center there. The majority of them were Muslim Bosnians whose parents were subjected to ethnic cleansing in the 1990s. These students really responded to class lessons on the history of the Holocaust, and asked to volunteer at the ceremony. At the program, they were in awe because for the first time, they were able to put a face with the Shoah history, and could personally connect to another group that understood genocide, first-hand. The Passover seder, which talks about freedom from oppression, is often used as a time for Holocaust reflection. In fact, many Haggadot include passages about the relationship between the Holocaust and Egypt. Some Haggadot even explain how victims observed the holiday in Nazi occupied Europe. A few weeks ago, just before Passover, one of my best friends, a 27 year old young professional working in Finance, discovered her own family’s experience in the Holocaust. It had a huge impact on her and inspired her to lead the seder at her home for the first time, and to intertwine the two histories. These are the vital connections we need to make with our survivors – teaching lessons to young people and within our own families – so that no future generation has to have first-hand experience with genocide again. I just returned from leading an extraordinary Jewish mission to Cuba sponsored by EntryPointDC with 14 other young Jewish adults in their 20s and 30s who live in the Washington DC Metropolitan area. The combination of these intelligent, adventurous, and compassionate participants with the charming and complex backdrop of Cuba made this one of the most amazing experiences of my life. On our trip we visited five Jewish communities and met their leaders, got to know their members and learned how they live and practice Judaism in Cuba. We visited synagogues, cleaned up graves in Jewish cemeteries, and distributed much needed supplies. We took in the sights and immersed ourselves in Cuban culture. We also spent much of our time with members of the young adult Jewish Cuban community, and we saw historic and educational sites together, socialized on Havana’s seafront promenade the Malecon, and sang and danced to Cuban music. Having exceeded all expectations, the trip was more wonderful than we could have imagined. Cuba is a fascinating country—a place of passionate music, lively dance and vibrant color. It is a living museum, filled with old American cars from the 50’s, apartment buildings from the 70’s and stunning Colonial, Baroque and Art Deco architecture. Music is everywhere and seems to be the soul of the island. Even though poverty is quite widespread, the Cubans we encountered were outgoing, social, and warm. They knew how to have a good time and keep spirits high. While we had many experiences that were incredible on the trip, one of the most memorable was visiting the Jewish Sunday School in Havana. The children smiled with delight when our group arrived with several bags of American candies and chocolates. Many of the children did not speak English, but we found a way to communicate through dancing. Each child approached us and said “bailar” and they taught us the hippo song, which continued to be a favorite song amongst our group. Then we taught the children the song, David Melech Yisrael. Since travel is only legally permissible under specific licensees granted by the U.S. Treasury Department’s Office, the Washington DCJCC obtained a license which allows travel by members of religious organizations to conduct religious activities. 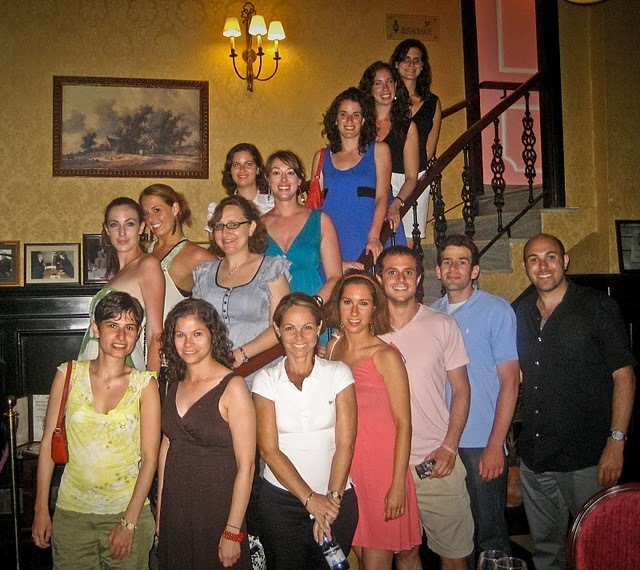 This is the first time that the JCC has ever sponsored a mission to Cuba for young professionals to bring support and aid to the Cuban Jewish community. These young professionals were incredibly generous and brought ample supplies of over-the-counter-medicines, powdered milk, films pertaining to Jewish life, sun block, and clothes, all of which are difficult to come by in Cuba. There were over 20,000 Jews in Cuba before the Revolution in 1959, and now only about 1,500 remain. Although this Jewish community is small in number, their pride, joyfulness, and spirit is undiminished. We had the privilege to witness the strength and heart of this community firsthand and learned that the value of a Jewish community is not measured by its population, but by the determination and passion of its individuals to continue and celebrate the Jewish way of life. Our trip to Cuba touched my life in so many ways: I made lasting friendships, built connections with the extraordinary Jewish community, and experienced the rich, lively culture and traditions of Cuba.